The 10th Annual Oilsands Banquet was significant in a number of different ways. 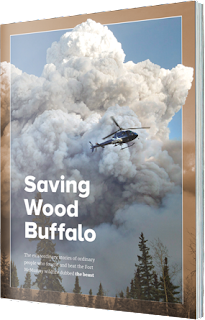 Most importantly, it honoured first responders and scores of others who contributed to the effort to save Wood Buffalo. I saw fire chiefs and firefighters from Calgary, Smoky Lake, Athabasca and various other locations in Alberta, fire fighting pros who joined the fight on the ground back in May. They were everywhere as the capacity crowd mingled during the pre-banquet reception. There were also many other non-uniformed heroes that were there: support staff, Atco gas and power personnel, water treatment plant operators, industry folks who did so much during those crazy days, and countless others. It was a big event; it was a big deal. In terms of a plated service banquet (as opposed to a buffet style affair), the Oilsands Banquet was the biggest held at Shell Place by a country mile. Executive Chef Ken Bowie and his staff knocked it out of the park and put on a helluva spread. There were many highlights of the evening for me, among them getting to sit next to Chief Allan Adam from the Athabasca Chipewyan First Nation. We enjoyed a great conversation about the fire and what happened with our respective families during the crisis. He went on to make what I felt was one of the best speeches of the night on behalf of the Athabasca Tribal Council. "Our home is your home," he said. 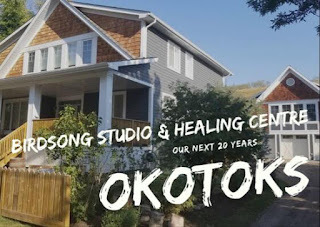 The words, and the intention behind them, really hit me - we were truly all in it together as we faced the wildfires and as we go through the rebuilding process. I painted Fire Chief Darby Allen on the 5th day of evacuation - Mother's Day. It was finally presented to him and the department as part of the Oilsands Banquet. A companion piece, painted more recently, was presented to RCMP Superintendent Rob McCloy as a thank you to the police officers that guided us to safety. 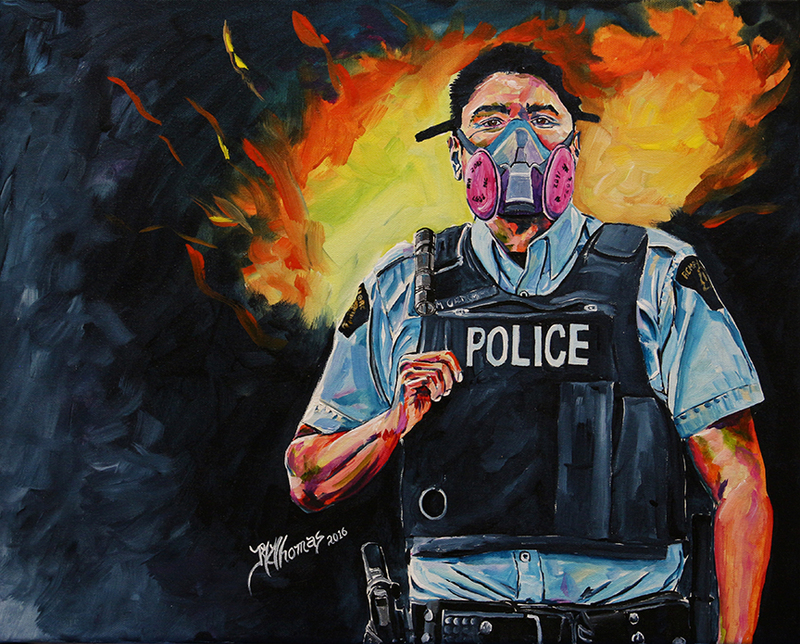 "The Officer" standing sentinel in against the backdrop of fire and smoke was inspired in part by a photograph taken by a Calgary based photographer named Chris Bolin (www.chrisbolin.com) and a story shared to me by a lady who works at the hospital who lived in Beaconhill. 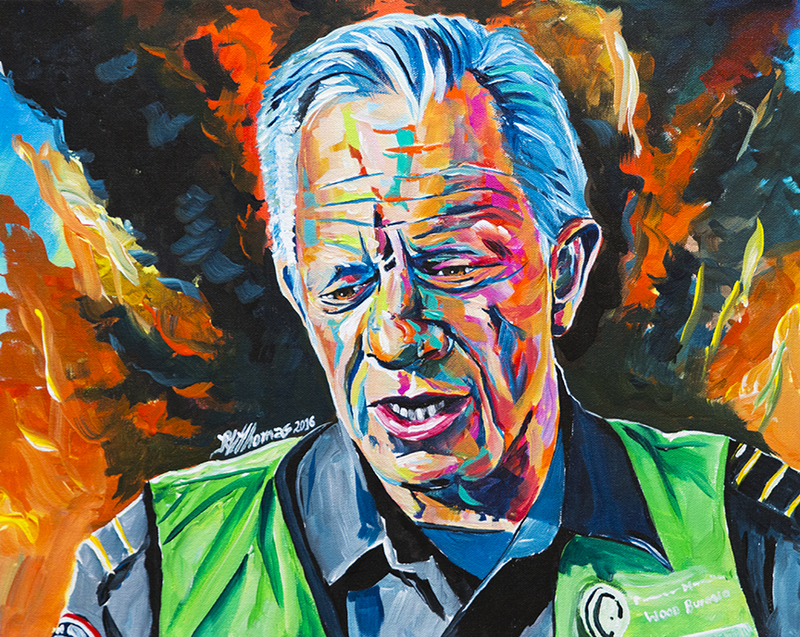 At the end of the event, we had tables stretched down the hall at Shell Place holding 16" x 20" prints of the Fire Chief Darby Allen painting. As I emerged, I saw first responders signing them with great purpose and intent. 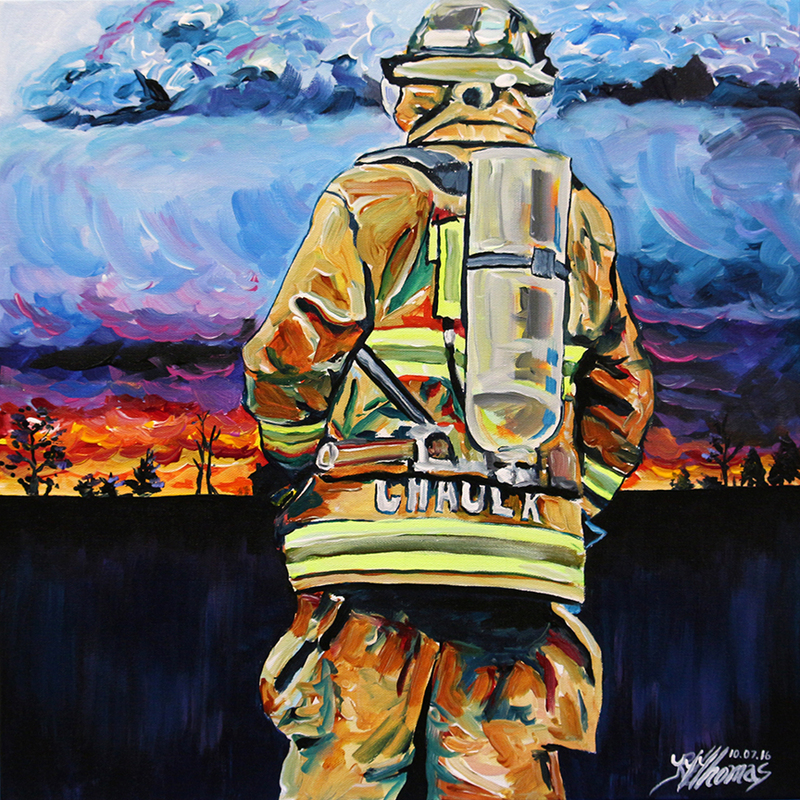 Behind each print was an individual or company that had donated $1,000 or more to the United for Fort McMurray effort. It was great to see Glenn Chaulk in the line. I had painted a tribute portrait of him after re-entry, a special gift from his brother Shawn. I saw my brother-in-law Chris signing. The value he has brought to the region since arriving late last year and the role he played during the crisis was and is significant. Chris had a long and distinguished career in the military and was right alongside Darby Allen and Dale Benfeld in the Emergency Operations Centre throughout the wildfires in his role as Assistant Deputy, Emergency Management. 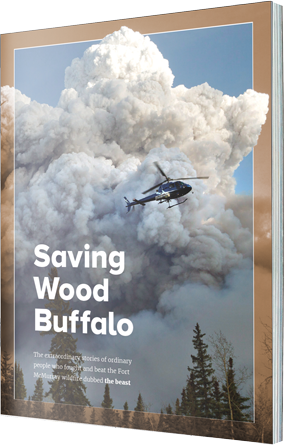 A publication called "Saving Wood Buffalo" was launched at the Oilsands Banquet. Those of us in attendance were able to take a copy home. I'm about half way through the stories and I can promise you that it is one of the best collections of perspectives about the fire, response and recovery that I have seen to date. 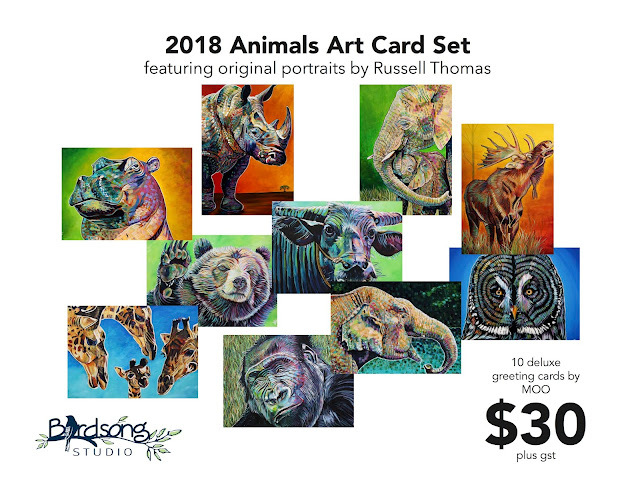 It is available for purchase by clicking here - $10 from each sale will go to the Fort McMurray Firefighters' Relief Fund. My deepest thanks to Phil Enarson and his team for putting on an amazing evening. Special thanks to BMO for their sponsorship and the $2 million they announced to support a broad range of community organizations. If you want to read about their investment in our recovery, please click here.